JERUSALEM (AP) — Benjamin Netanyahu's hardline coalition partners on Sunday stepped up pressure on the Israeli prime minister, threatening to topple the government if he caves in to American pressure to accept a key Palestinian territorial demand in U.S.-backed peace talks. 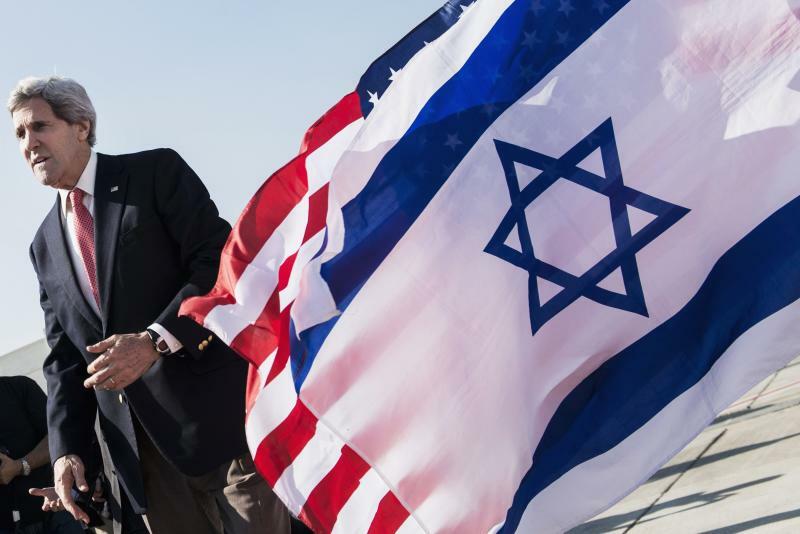 The warnings came as U.S. Secretary of State John Kerry took a brief break after three days of talks with Netanyahu and Palestinian President Mahmoud Abbas, jetting off to the Arab world to discuss his efforts before an expected return to Jerusalem later Sunday. In a sign that Kerry is intensifying the pressure, a Palestinian official confirmed that the secretary asked Abbas to recognize Israel as the Jewish homeland. Abbas has repeatedly rejected this Israeli demand, saying it would compromise the rights of Palestinian refugees and Israel's Arab minority. The official spoke on condition of anonymity because Kerry has barred the sides from discussing the negotiations in public. Kerry was meeting with the leaders of Jordan and Saudi Arabia on Sunday, possibly to win Arab backing for any Palestinian concessions. Before departing, Kerry told reporters that had he made some progress in his marathon talks over the weekend. He praised both Abbas and Netanyahu for making "difficult decisions." "You can see in the press and you see in the public debate that the choices they're making elicit strong responses from their people. 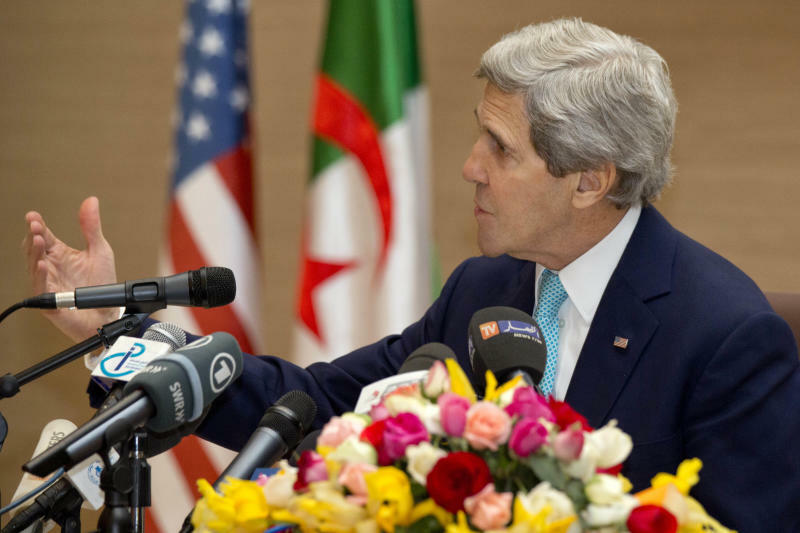 And I understand that very, very well," Kerry said. Under heavy U.S. pressure, Israel and the Palestinians agreed last July to relaunch their first substantive talks in nearly five years. 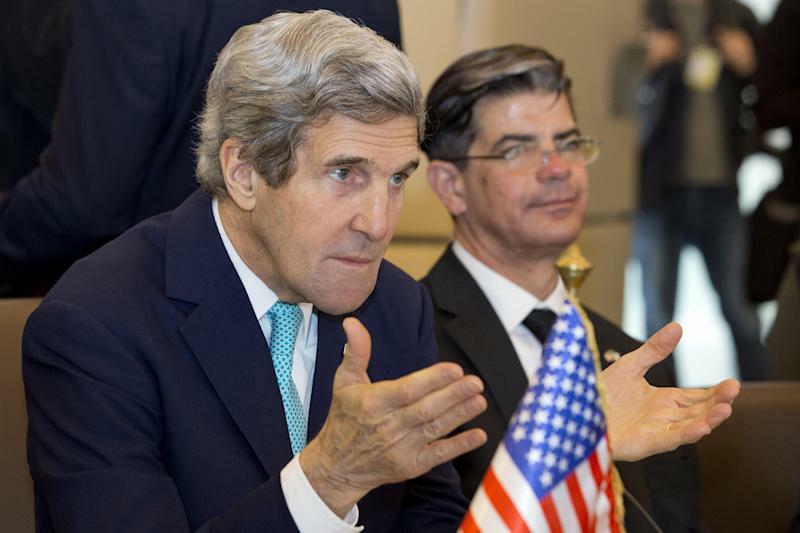 With an April target date for an agreement looming, Kerry has increased his involvement by presenting bridging proposals on this trip to try to reach a framework agreement that would spell out the terms for a final peace deal. Kerry has refused to discuss substance with reporters. However, the apparent trade-off is Palestinian recognition of Israel as a Jewish homeland, in exchange for Israel's acceptance of its pre-1967 frontier as the baseline for border talks. The Palestinians want a state in the West Bank, Gaza Strip and east Jerusalem, lands Israel captured in 1967, but would accept minor land swaps to allow Israel to keep some Jewish settlements. So far, Netanyahu has refused to commit to the pre-1967 war lines as the starting point, at least in public. Netanyahu, in turn, demands Palestinian recognition of Israel as the Jewish homeland, a condition he says must be met to ensure the conflict is ended once and for all. "Opposition to recognizing the Jewish state and our right to be here is continuing," Netanyahu told his Cabinet on Sunday. He said the Jewish people are "not foreigners" in the Holy Land. "I reiterate that in my view, this is the root of both the conflict and the incitement, the non-recognition of this basic fact." Kerry has refused to discuss the details of his proposals, but noted Sunday that all of the core issues of the conflict fit together like a "mosaic." "It's a puzzle, and you can't separate out one piece or another. Because what a leader might be willing to do with respect to a compromise on one particular piece is dependent on what the other leader might be willing to do with respect to a different particular piece," he said. Such talk has begun to unnerve Israeli hardliners, who oppose a pullback to the 1967 lines on both security and ideological grounds. The Jewish Home, a hardline party affiliated with the Jewish settler movement in the West Bank, threatened to pull out of the coalition if Netanyahu accepts the 1967 borders as the baseline for talks. "A government that accepts the 1967 lines is committing national suicide. We will not be part of it and will try to replace it," said Ayelet Shaked, the party's faction chairwoman. Netanyahu's foreign minister, Avigdor Lieberman, said any final peace deal would have to redraw the borders to place large chunks of Israel's Arab minority on the Palestinian side. "Without swapping territory and populations, Yisrael Beitenu will not support an agreement," he told a group of diplomats. Lieberman's Yisrael Beitenu Party formed a joint list with Netanyahu's Likud before parliamentary elections last year. The union makes up the largest faction in parliament, and Lieberman's withdrawal from the coalition would rob Netanyahu of his parliamentary majority. Lieberman insisted his proposal would not uproot anyone from their homes. Instead, he said the border would be moved. "There is no reason why they shouldn't join their brothers the Palestinians under full Palestinian sovereignty and become citizens of the future Palestinian state, which they yearn for so much," Lieberman said. Both the Palestinians and Israeli Arabs, who make up about 20 percent of Israel's population, oppose the plan, saying it would undermine the rights of Israel's Arab minority. If either hardline partner bolts from Netanyahu's coalition, dovish opposition parties have said they would provide Netanyahu with the support he needs to keep his parliamentary majority.